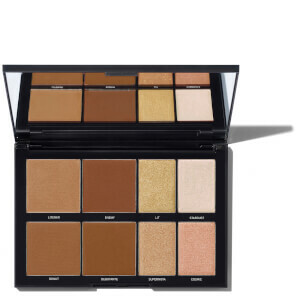 Accentuate your facial features with Morphe 8H Hi-Fi Sculpt and Shimmer Palette; four matte contouring shades and four high-impact highlighters housed in a sleek compact. Blendable and buildable, each smooth, creamy formula can be worn alone or blended for customised results. Sweep a warmer shade across your nose and cheeks for a sun-kissed bronze look, and apply highlighter to the high points of your face for a natural glow. Expect long-lasting depth and dimension with a professional finish. Suitable for tan/deep skin tones. Alle fargene kan brukes alene, eller blendes eller lagvis for en skreddersydd effekt. Bland to konturfarger sammen og sveip lett over de høyere punktene i ansiktet for å gi ditt ansikt en solkysset varme. Husk at kaldere farger gir en meislet, skyggeaktig look, mens varmere farger gir en bronseaktig glød. Shades: Beam, Venus, Mirage: Mica (CI 77019), Dimethicone, Synthetic Fluorphlogopite, Boron Nitride, Phenyl Trimethicone, Polyethylene, Silica, Magnesium Myristate, Phenoxyethanol, Caprylyl Glycol, Ethylhexylglycerin, Tocopheryl Acetate, Tin Oxide. +/- May Contain / Peut Contenir: Bismuth Oxychloride (CI 77163), Titanium Dioxide (CI 77891), Iron Oxides (CI 77491, Iron Oxides (CI 77492), Iron Oxides (CI 77499), Red 6 Lake (CI 15850). Shades: Debutante, Blogger, Fabulous: Mica CCI 77019), Talc, Dimethicone, Zea Mays (Corn) Starch, Magnesium Stearate, Phenyl Trimethicone, Boron Nitride, Nylon-12, Silica, Caprylic/Capric Triglyceride, Trimethylsiloxysilicate, Phenoxyethanol, Caprylyl Glycol, Tocopheryl Acetate, Ethylhexylglycerin.+/- May Contain / Peut Contenir: Titanium Dioxide (CI 77891), Iron Oxides (CI 77491), Iron Oxides (CI 77492), Iron Oxides CCI 77499). Shade: Donut: Mica (CI 77019), Dimethicone, Magnesium Stearate, Boron Nitride, Nylon-12, Silica, Caprylic/Capric Triglyceride, Phenoxyethanol, Caprylyl Glycol, Tocopheryl Acetate, Ethylhexylglycerin.+/- May Contain / Peut Contenir: Titanium Dioxide (CI 77891), Iron Oxides CCI 77491), Iron Oxides (CI 77492), Iron Oxides (CI 77499). Shade: Big Bang: Mica (CI 77019), Dimethicone, Synthetic Fluorphlogopite, Phenyl Trimethicone, Polyethylene, Boron Nitride, Magnesium Myristate, Phenoxyethanol, Caprylyl Glycol, Ethylhexylglycerin, Tocopheryl Acetate, Tin Oxide. +/- May Contain / Peut Contenir: Bismuth Oxychloride (CI 77163), Titanium Dioxide (CI 77891), Iron Oxides (CI 77491), Iron Oxides (CI 77492), Iron Oxides (CI 77499).